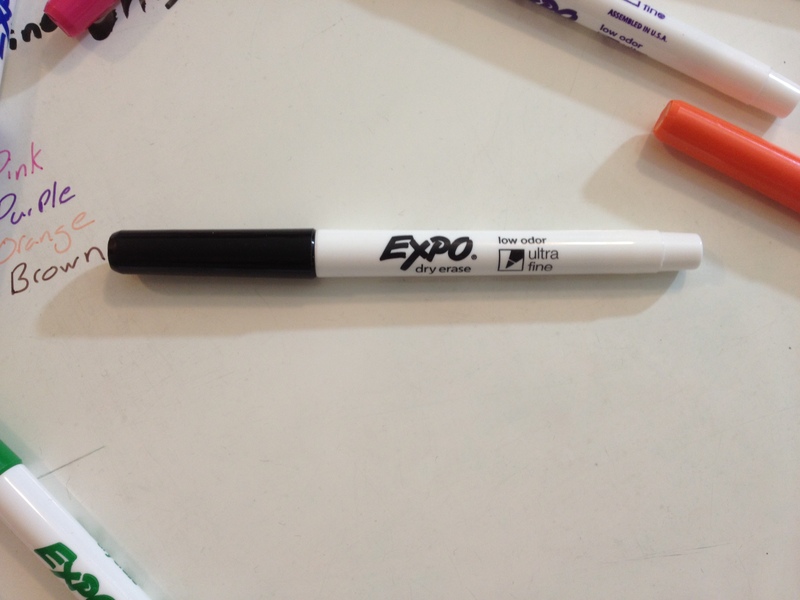 When it comes to dry erase markers, Expo is almost the only brand people recognize out there. Their chisel-tip markers are almost ubiquitous in any place that requires a white board, and are generally what people replace the cheap in-package markers from home magnetic boards with. And while I like the markers and always have, I do have a problem with their tip size. Even the fine point markers are large enough to be hard to use for people who like to write fine lines, like I do. 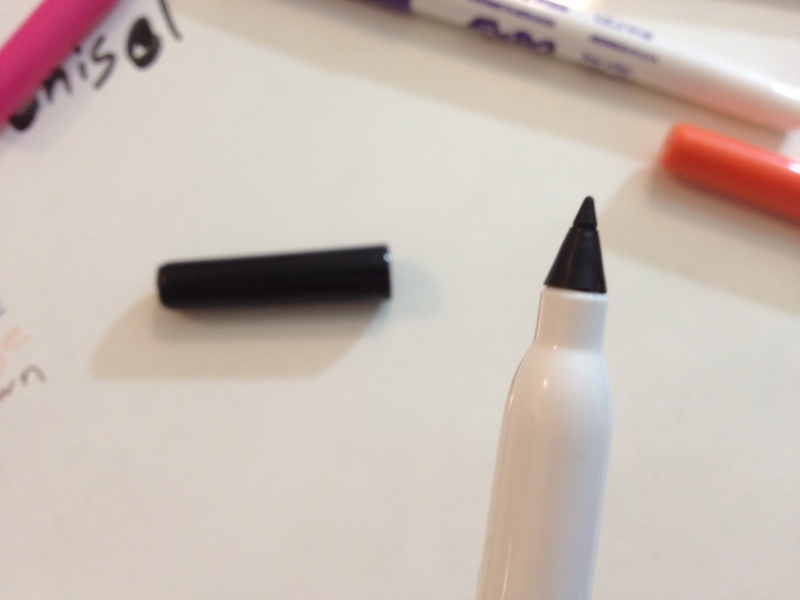 Fortunately, there are slightly-less-popular, but still easily available Expo markers with an “ultra-fine” tip. Are they much better? The body design is almost identical to the fine tip versions, with a slight taper from the middle to the ends. There is a step-down on the rear to allow for easy posting. There is also a step-down from where the cap is removed to the section. The cap and all of the writing on the pen is loosely in the color of the ink. The section can be a bit slippery, but it’s never a problem. It ends in a small cone with the point that is indeed very fine for a dry-erase marker. The information presented on the side is standard and useful enough. The tip is very fine when compared to a regular fine marker. It gets down to a medium/broad on a regular ball or fountain pen. The ink flows smoothly and erases easily, as one would expect from the Expo brand. The black is the standard Expo black, and does the job. It doesn’t start to wash out at this size and is perfectly readable. 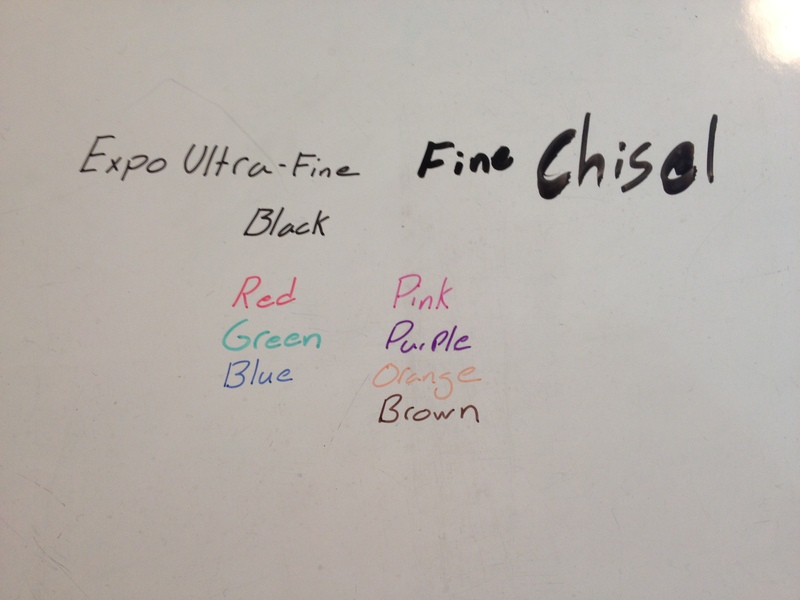 For anyone who needs to mark something with a bit of a finer point (like on a map), wants to write regularly on a dry-erase board, or for those who are artistically inclined and were frustrated when they couldn’t get the various line sizes they needed out of the more standard Expo markers, these work very well. They are of the same quality as the other markers in the line (which is to say as good or better than competitors) and offer a much smaller and more manageable line. This entry was posted in Beginner Supplies, Utensils and tagged art, art supplies, art supply, dry erase markers, EXPO, expo markers, expo ultra fine markers, marker, markers, review, ultra fine by Dragon Co (Austin Smith). Bookmark the permalink. THANK you for doing this review. It might seem trivial (a mass-produced marker) but I was tired of trying various brands with so-called “fine” points. Now I know.